John Fort of Peachtree Stable has been around the game of racing long enough to know that things don’t always go according to plan. But with Hall of Fame trainer Bob Baffert in his corner, nobody would blame the owner for growing accustomed to success as the norm. Most recently, the duo was forced to regroup after their highly regarded 2-year-old colt Serengeti (Algorithms) crossed the wire a disappointing second as the even-money favorite in his June 10 Santa Anita debut–a performance that was likely a product of studishness in the post parade and greenness on the racetrack, where he struggled with his lead changes and proved no match for Runaway Giant (Ghostzapper) in the stretch. 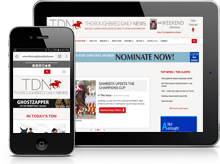 Equipped with a race under his belt and the services of Hall of Fame jockey Mike Smith, Serengeti more than lived up to that hype in his second start Sunday, reporting home a front-running 11-length winner–a performance that earned him ‘TDN Rising Star’ status [video]. Vastly more professional at second asking, the handsome bay separated from his rivals at will, changed his leads on cue and glided to the wire under minimal encouragement. A tireless student of the sales game, Fort recalled that he was immediately in awe of the powerful build of the Algorithms colt when he and his wife, Elizabeth, visited the St. George Sales consignment in the days leading up to the 2016 Keeneland September sale. Fort said he was not actively looking for a second-crop offering from the Claiborne stallion Algorithms (Bernardini), but noticed that Serengeti had a strong hip, reminiscent of his sire. Likewise, a set of pristine x-rays, a straight hind leg and a “Grade I throat” scope added to the colt’s appeal. According to Fort, pedigree was somewhat ancillary in guiding him towards an eventual purchase, but he was well aware of the topside productivity of the mare Ava Knowsthecode–who in addition to Algorithms is also responsible for sires Justin Phillip (First Samurai) and Keyed Entry (Honour and Glory), as well as GISW Greenpointcrusader (Bernardini). Serengeti had plenty of damside appeal to boot as the son of an unraced half-sister to Baffert-trained GSW Fast Bullet (Speightstown) from the family of champion Brave Raj (Rajab). Although Fort already had his mind set on acquiring the yearling, his commitment was solidified when Baffert and his wife, Jill, entered the fray as co-owners. The Forts are close friends with the Bafferts beyond the confines of the racing world, and were thrilled when the trainer provided his stamp of approval when evaluating Serengeti. Peachtree and Baffert teamed to win the 2011 GI Kentucky Oaks with Plum Pretty (Medaglia d’Oro). Any concerns were put to rest when the hammer dropped at $200,000, with Fort signing the winning ticket. Serengeti was sent to Central Florida, where he spent roughly six months learning to become a racehorse under the tutelage of Barry Eisaman. While the 2-year-old did not reach the level of physical maturity forecasted by Fort, it was once again Baffert who provided reassurance that they had something special. Baffert determined that Serengeti was ready for the racetrack and had him shipped to join his 2-year-old string at Los Alamitos. His stay there was short-lived, however, as he progressed through his training with flying colors and drew rave reviews from Baffert’s assistant, Mike Marlow. 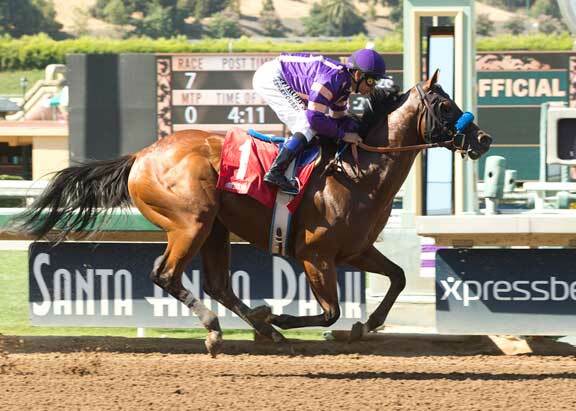 The juvenile showed more of the same at Santa Anita, entering his June 10 debut as a heavy favorite in the minds of the betting public and Fort, himself. Although the colt was forced to settle for second that day, his authoritative victory Saturday has him on track for a stakes debut in the Aug. 12 GII Best Pal S. at Del Mar. Fort added that he is hopeful that Serengeti can one day successfully navigate a two-turn trip, but sees nothing wrong with campaigning an exceptional sprinter. As he learned with three-time Grade I-winning sprinter and Spendthrift Farm stallion Lord Nelson (Pulpit)–who he scooped up for $340,000 as a Keeneland September yearling–Baffert is at his best when he allows fast horses to strut their stuff.